From an artist's perspective I'd have to say it all looks very intuitive and very much in line with the way many visual artists would interact with their traditional Visual Diaries (for non-artists that's the A4 or A5 size ring bounded sketch books you sometimes see us carting around and scribbling in). 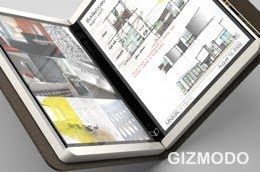 The two screens, fold in half like a book concept is genius. Devices like this will need to be robust and what better way to protect the screens than to fold it in half so the outer cover gets all the scratches. Does it really annoy you when your mobile phone screen gets scratched? Me too. This device has a built in camera and presumably Wi-fi connectivity as it is internet capable. One hopes it will also have a built in microphone and that the camera will also be capable of filming video. With that combination artist types like myself can use this device to record the things we see in images (moving and stationary) and sound. Given that this device is also intuitive enough to allow sketching with the stylus pen you've pretty much got me hooked. Beef up the RAM and make sure it has some kind of removable storage medium (such as SD cards for example) and this will be on my Christmas list. Heck I'd even consider spending all the money I was going to spend on Christmas gifts for everyone else on getting me one of these!! The proposed user interface (i.e. the software) looks well thought out. I particularly like the use of the hinge/spine to 'tuck' items that you want to hold and move to other pages of the book (wonder how that works for text?). There's nothing particularly ground breaking about the software - you could easily use the same software on a single screen device divided into two regions (which they demonstrate in the video by downloading your Courier Book to a laptop computer). Oh and that 'tuck' feature - you could do the same thing just with a standard 'cut' and 'paste' feature and an infinite 'clip board'. However visually it looks fun to use and more like how people work rather than how computers work. It's more like using an actual book than a computer. If they manage to eliminate the use of a keyboard altogether the art of 'hand writing' may just see a resurgence. I just hope they don't over do the hand writing recognition to the point where everything you write turns into a nice, clean, readable font like 'Times'. So that's just a few of my thoughts on a product that's supposed to be in development but who knows for sure if the Microsoft Courier Booklet will ever see the light of day (or the inside of my back pack).